Kota Kinabalu is a busy city with a small town atmosphere. Affectionately known as simply KK, the longer you spend here the more the place grows on you. Overlooking the South China Sea and the beautiful tropical islands and virgin rainforest of the Tunku Abdul Rahman Marine Park, the Crocker Range and Mount Kinabalu as its backdrop, one could not wish for more superior visual variety. Previously named Jesselton, it was razed to the ground in WWII by the Allied Forces abandoning it during the invasion of Japanese. In 1963, the rebuilt city was renamed to Kota Kinabalu. Kota Kinabalu is a very safe city, but the usual travel street-smart applies. Food is excellent and very affordable as you will discover on our Eating Out in KK page were we recommend our favourite restaurants. KK is compact, easy to orientate (once you see the map) and you can walk pretty much everywhere. The Kota Kinabalu International Airport (KKIA) is conveniently located just 7km south west of the city centre. A taxi ride to the city costs RM35 with a prepaid taxi coupon purchased from the taxi counter outside the arrival hall. Between midnight and 6.00am there is a 50% surcharge. Buses run frequently between the city and airport, although at Terminal 1 the buses only service the main road and do not run into the airport property. With the exception of Licorice Allsorts and Tetley tea bags you can buy or find everything you need here. All the usual fake wares are available if you are looking, although nowadays less so, but genuine named brands can be purchased at very affordable prices. You can find genuine and international named brands in shopping malls in Kota Kinabalu such as the Imago Shopping Mall and Suria Sabah Shopping Mall. If you fancy a little drive, you can also visit the 1Borneo Shopping Mall. Coach, Guess, Kate Spade, Victoria’s Secret, Timberland, Sephora, Michael Kors, and other brands have outlets in these malls. KK is heaven for shopaholics! 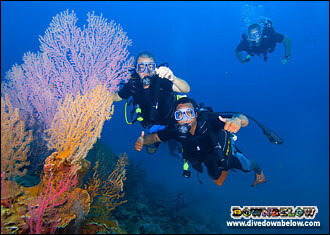 If you are in Kota Kinabalu, Downbelow have very unique PADI 5 Star CDC Dive & Adventure Centres, tropical paradise based on Gaya Island in the Tunku Abdul Rahman Marine Park. We conduct daily snorkelling, scuba diving, and trekking excursions, all located around our beautiful dive station. With so much to offer so near the city, visitors of our island-based dive centres whole heartedly agree when we say no visit to Kota Kinabalu is completed without at least visiting us once! If you want to take part in an excursion that will be more than just a day trip, then options for that also abound. And if you wish to enjoy multiple days of scuba diving or snorkelling while staying at a luxurious beach resort, we have programs at Manukan Island too! Below are a few suggestions that requires at least one overnight stay. Our Downbelow Eco Lodge have rooms to suit all budgets. You can visit us at KK Times Square, contact us via phone or email or for bookings. Visit our website to book online and have your room confirmed within minutes. To know the very wide range of accommodation available in Kota Kinabalu, get in touch with our Travel Centre Team today.